A 12 x 12 inch polar dial of printed plastic. Unlike the typical polar dial, this dial uses point-in-space or nodus gnomons. The dial face is aligned in the polar plane; separate face markings and gnomons show summer-to-winter and winter-to-summer hour and date lines corrected for EOT and longitude. Time and date are read from the shadow of only the tip end of each gnomon rod. The three foot high PVC dial support allows the face to be rotated about the polar axis; the face is pointed at the local meridian for ST and rotated 15? east to set for DST. The face has hour lines for 8 AM to 4 PM and date lines for each month. The hour and date lines were designed for the dial location, median solar declination and the equation of time over a leap year cycle, atmospheric refraction and shadow shortening due to the 90? included angle conical gnomon points. The dial is accurate within two minutes. Dial face is marked with location, coordinates and designer name. This dial is located within Fleet Landing, a gated retirement community. Please contact Russell Boyd, the dial owner/designer at 904-241-8544 to arrange visiting the dial. This is a simple equatorial dial 58 inches wide and 49.5 inches high. Because of the low latitude, the 6 inch wide equatorial band has Roman hour markings only from 7am to 5 pm. The gnomon is a thin, unadorned rod. The dial base is a square box with canted top to the Florida latitude, supporting the equatorial cross members. As the tour pamphlet states,"The striking armillary sphere sundial, donated in 1986 by the Gowan family, terminates an important sight line from the Turtle Court. Two Washingtonia palms stand like tall sentries as visitors cross the arcade from the Turtle Court to the sundial." The bronze dial about a meter in diameter has a 3-inch bronze equatorial band with Roman numeral hour marks on the interior and signs of the zodiac on the exterior. 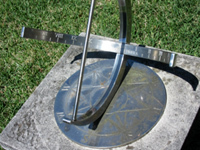 The gnomon is a arrow rod that fits the "massiveness" of the sundial. All sit on an ornate granite pedestal that in turn sits on a square dais elevated about 6 inches from the ground. The oblong 28 inch long x 14 inch high vertical dial appears to be cast aluminum, painted black, but with much of the paint worn off. The dial plate is surrounded with a motif of decorative fish, star fish, shells and scales. The hour lines are most peculiar. The lines are numbered from 7am to 5pm, but there are two more morning and evening hour lines, none of which are horizontal that would be expected for 6am and 6pm. In laying a proper set of hour lines for latitude 29.658 on top of a photograph of the dial, the hours from 9am to 3pm appear nearly correct. The 8am and 4pm hour lines appear at what is really 8:30/3:30, the 7am and 5pm hour lines appear at what is really 8:00/4:00. The last two dial hour angles for morning or evening are totally irreconcilable. The brass gnomon, in the shape of a downward pointing arrow, is bent, but perhaps more disconcerting is that it is mounted on a pivot, indicating that it can be moved to different latitudes. The dial, although decorative, certainly is not a worthy timepiece. A large stone analemmatic in the Endangered Plant Garden. Amid the many coral blocks (oolitic limestone rock) carved by eccentric Edward Leedskalnin (1887-1951) is a huge monolithic sundial. The gnomon is a horizontal L-shaped piece of iron fastened to the north corner of a limestone block about 8 feet high, weighing about 15 short-tons. Below the gnomon, carved into a second block of limestone is a portion of a hemisphere, smoothly filled in with concrete. Drawn on the hemisphere are analemma shaped hour and half-hour lines from 9am to 4pm. You can read the time with an accuracy of about two-minutes. A 16 foot diameter analemmatic dial of broken mosaic tiles. The numerals, months and lines are made with broken colored tiles. The major axis is 10 feet. A movable vertical gnomon is available for increased reading accuracy but a standing child is the usual gnomon. The colored number tiles are white for DST and black for ST.
An interactive analemmatic dial with 6x3 meter major and minor ellipse axes and built of precast concrete, tiles and glass with Roman hour numerals. Dial face markings include Ante Meridiem, Post Meridiem, astronomical symbols for days of week and constellations of the zodiac, compass rose, Sun face, Ursa Major bear constellation with Big Dipper asterism, Polaris solar cell visible at night beneath the noon mark, artistic analemma and artist inscription. Inspired by the analemmatic dial "Keppel Henge" located at Georgian Bay, Ontario, Canada, the dial was two years in design and construction, with financial support from Ms. Dotty Blacker of Valparaiso, Florida and the NWFSC Foundation. Dial accessories include 8 and 12 foot gnomon poles with leveling clinometers allowing the dial to be used with precision for demonstration and instruction. The dial is a focal point for geoscience instruction both in the classroom and the local community. The Science Department at NWFSC offers many courses in the geosciences that benefit from the dial, including Earth Science, Physical Science, Physical Geology, Oceanography, and Astronomy; supports baccalaureate programs in Elementary and Middle School Math & Science Education; and is frequent host to a local astronomy club. Bronze, granite An obelisk which, at the noon hour, will cast a shadow on a noon mark plaque positioned on the ground. A bronze horizontal dial approximately 24 inches square on a painted masonry pedestal. Inner hour circle shows Arabic numerals for standard time and outer hour circle shows Roman numerals for local time. Dial face includes cardinal direction marks and coordinates. An EOT table is provided in an adjacent bronze plaque atop the pedestal. 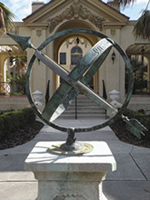 Dial is located on the entrance walkway to the Flagler Museum, formerly known as Whitehall, Henry Flagler's private home. Museum is open to the public but requires an entry fee. A large horizontal dial of cement and gravel within a 30 foot diameter hedge. Approximately 2 x 3 foot vertical painted dial on wall of cathedral. Dial face includes hour lines with Roman numerals and 15 minute marks, and location coordinates. Wall orientation and gnomon alignment not verified. The Cathedral-Basilica of St. Augustine was founded on Sept 8, 1565. A rectangular building 42 feet wide and 120 feet long formed the original structure, with walls of coquina, a rocklike amalgam of sea shells. A fire destroyed much of the Cathedral in 1887, but the walls survived. The reconstruction includes a new bell tower at the South end of the Cathedral. A vertical sundial is painted on the South wall of the tower about 15 feet above ground above a doorway. The dial is about 3 by 4 feet with simple lines marking the hours and quarter hours from 8 am to 5 pm. The gnomon is a simple rod and appears bent. A picture of the dial taken at 12:30 EDT on March 12 shows a shadow time of about 2;15. Sculptor Eric Higgs was originally approached by Robin Reed,who chaired the historic preservation committee for the Historic Old Northeast Neighborhood Association. She was interested in sprucing up a decrepit area where sundials once stood at Vista Point, Flora Park. From the 1930's to the 1970's two different sundials were located on this site. The plan to refurbish the last sundial slowly evolved into a plan for a new sculpture that "escalated into a project for the [waterfront] centennial." A 12-inch diameter horizontal bronze dial set on a simple fluted pedestal. The dial face includes hour lines with half hour and ten minute marks and a central compass rose. The gnomon includes an adjusting screw allowing the gnomon angle to be set to the latitude angle. The dial is located in a small garden area of an elementary school and includes a nearby flagstone bench. The walkway around the dial is of red bricks inscribed with the names of graduating students. Students learned of the death of a 9 year old classmate and through their fundraising efforts helped establish this memorial dial in their schoolyard. A visitor's pass is required from the administration office before viewing.